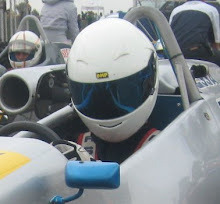 The opening round of the 2011 National Formula Vee championship took place at the fast and flowing circuit of Phakisa this weekend when the category rejoined the Pro Tour. Runner up to the 2010 championship and MSA development driver Zaahir Essa (Reflex Solutions) arrived with high hopes in his Lotto-provided Rhema 2 vehicle. Essa seemed to struggle with setting up the handling of the car and qualified 4th for the first heat. After immediately making up places off the start, he managed to latch onto race leader and 2010 champion Peter Hills (Renexcon) for the first few laps. Hills began to develop gearbox problems and dropped back for a moment, allowing Essa, newcomer Michael Taylor (Michael Taylor Racing) and veteran Symm Grobler (Auto Mecca) to join in for a monumental fight for the lead. Essa managed to work his way to the front of the dogfight in the last few corners and came across the line to take victory. The second heat proved to be as exciting as the first, except Hills managed to make his way through to the front early on. Taylor, Essa and Grobler got involved in a frantic dice for second place, allowing Hills to disappear ahead unchallenged. The second-place pack had a new leader at almost every corner of the race, and Essa ended up losing out at the end and finished 4th. Essa lays a joint-second place in the championship with the next round scheduled at Zwartkops Raceway on the 19th of March.